A third Samford University student has earned a 2013 Fulbright honor. 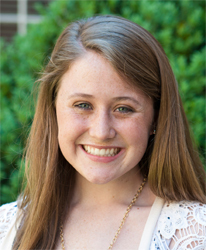 The U.S.-U.K. Fulbright Commission has chosen freshman political science major, Beeson Exceptional Scholar and University Fellows honors student Laura Ann Prickett to take part in the 2013 Fulbright Summer Institute at England’s University of Bristol June 1-29. Samford senior Chase Trautwein and 2012 alumna Samantha McFarland recently were selected to serve as Fulbright English Teaching Assistants in Germany starting in the fall. The Fulbright Summer Institute at the University of Bristol is one of the world’s most prestigious and selective summer scholarship programs. Prickett, of Decatur, Ala., was selected from a strong applicant pool to experience the U.K. in the four-week summer program. During her stay at Bristol, she will study the slave trade with professors from all three continents involved in the historical “triangular trade”–Europe, Africa, and North America. “I am most excited about the opportunity to compare the abolitionist movement in the U.K. to the movement in the U.S.," Prickett said. Prickett also expressed her gratitude to the commission and to the Samford faculty who guided her through the rigorous application process–Dr. Bryan Johnson, Director of Samford’s University Fellows program, and Classics and Fellows professor Dr. Shannon Flynt, Samford's Fulbright Program Advisor. The U.S.-U.K. Fulbright Commission selects participants through a rigorous application and interview process. In making these awards the commission looks not only for academic excellence but also for a focused application, a range of extracurricular and community activities, demonstrated ambassadorial skills, a desire to further the Fulbright program and a plan to give back to the recipient’s home country upon returning. Prickett’s record in these areas speaks for itself. This year she earned Samford’s Omicron Delta Kappa Leadership Honors Society’s Freshman Leadership Award for her involvement on campus and in her community. While maintaining her place on the dean’s list, she served on the Student Government Association’s Freshman Forum, on the Freshman Representative Council, as Vice President for the Alpha Lambda Delta freshman honor society, as a member of the Zeta-Zeta Chapter of Chi Omega, and as a peer mentor and tutor at a Birmingham-area school. Prickett is a graduate of Decatur Heritage Christian Academy where she served as Beta Club Vice President, Class Chaplain, Key Club Chaplain, and on the ACSI Accreditation Student Panel. She served as captain of the school’s forensics, speech and debate team and won the state championship in duo interpretation. Created by treaty in 1948, the U.S.-U.K. Fulbright Commission is part of the Fulbright program conceived by Senator J. William Fulbright in the aftermath of World War II to promote leadership, learning and empathy between nations through educational exchange. Award recipients and summer program participants are future leaders who will support the “special relationship” between the U.S. and U.K. Approximately 12,000 U.S. citizens have studied in the Fulbright U.K. exchange program.